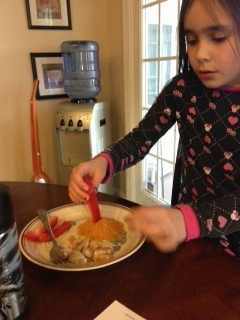 I had to laugh today as my daughter was eating her lunch after doing a bunch of drills for Memory Master. She had mashed sweet potatoes, chicken and sliced red peppers. I look over and she's building a volcano out of her sweet potatoes. I see her put a red pepper in it and declare "Look Mom, it's an active volcano!" She then removed the red pepper, eats it and then puts a piece of chicken on top of her "volcano" and declares "This is the smoke of an intermittent volcano, Mom!" and then eats that piece. Next she takes the "volcano" potatoes and closes her "crater" and says "This is a dormant volcano!" and she proceeds to finish eating. I thought to myself, I wonder how many kids in Public School think this way? I'm always trying to help her see how things relate to one another and how the subjects cross over from one to another and ultimately, all point back to God. I realized just how classical her thinking is becoming while eating lunch today....she's not confined to thinking within the context of the subject she's in. What she's learning flows into her entire life - even her food. It's the paradigm she views her life through. She's learning to think classically. 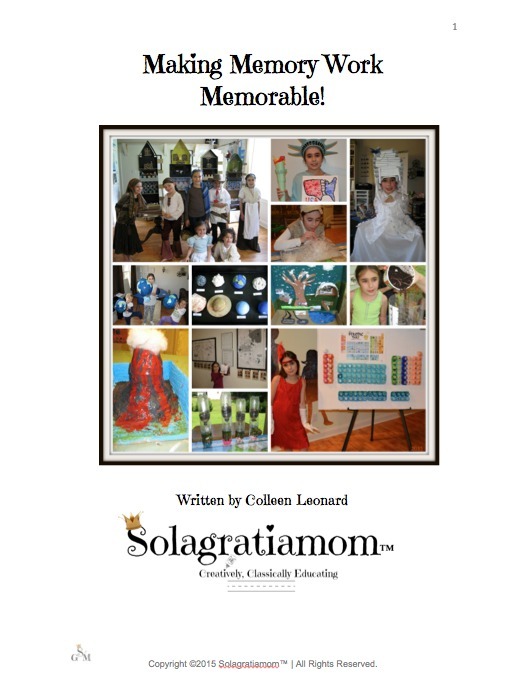 I've been asked by several Moms about how to prepare your child for Memory Master if their child has expressed an interest in doing it. Each child is certainly different, but I can share some of the things I do at home and within my CC Community to try and foster an atmosphere of excellence - which is ultimately, what Memory Master is about to me. Having a special needs son has taught me to expect more than you may see on the surface in people and especially, children. Expecting your child can be a Memory Master, instills confidence and helps them to work harder and go beyond what they may even think they can do. I treat my entire class that way. I set that tone for my class from day one - this year they almost all raised their hand that they were going to go for Memory Master testing next month. They may or may not all make it to the Director level - but the fact that they all wanted to do it and are going to at least go as far as testing with me, spoke volumes to me. They've been like iron sharpening iron this year and all striving and working very hard and it shows and they're only 6-8 year olds! I'm very proud of my class and what I've seen them achieve so far this year. I encourage and push them in love, hoping to inspire them to reach their full potential. I set the bar high and make it fun and love them, so they want to reach it. I'd encourage you to do the same at home. Set the bar high, push them in love, when they do more than they thought they could-reward that and give them confidence that they can do more than they think they can! On a practical level I drill at home consistently throughout the weeks. Throughout the school week I take my CC Foundations guide and in pencil I ask her to go through one or two subjects for 6 weeks worth of memory work and mark any areas she might need help or get incorrect with a check mark. I re-drill those areas that are weak and retest multiple times to make sure she has it mastered before I move on. We do it silly and funny to make it not so arduous. We may sing in opera, dance as we sing it, stomp, clap, run, jump or whatever she wants to do to make it more fun. Some days I let her jump on our indoor trampoline and drill through the memory work! Whatever it takes! I also offer to cut down on copy work for the things she can answer correctly. For example, instead of writing out all her skip counts on a given day for Math, she may "skip" the copy work for the ones she can say correctly. Any one that she requires help or hesitates, she writes them out. I use the memory work as a way for her to earn various things throughout the day. For example, if my daughter asks me for a break, I'll say "sure if you can skip the X's or tell me about X" (insert any memory work for X). Of course, she gets it whether she's correct or not and it just tells me if I need to drill it more. We also listen to our CD in the car and I have it on my MAC in the kitchen and it plays throughout the morning during breakfast or at dinner. We put the video on of the timeline hand motions and we do them watching the video side by side together on some mornings for review. I try to weave CC throughout her days and make it a part of our everyday conversations. Anything that can tie into the memory work from this (or the previous two cycles), I am always pointing out (and now she's getting good actually, at pointing them out too). Copy work for the memory work which is available on CC Connected and comes with the Teaching Plan, as well as file folder games that are available for matching up memory work is also great review. Another thing we do is together think of hand motions that create an association so it's easier to remember the memory work. For example on the Four Types of Volcanoes - we used jogging in place for "active", we traced our hand like we had a mitten on for "interMITTent", we put our hands up to our heads like we're napping on them for "dormant" and finally for "extinct" we stuck our tongue out and put our hands up to our throats like we were dying. We do projects in Wonderful Wednesdays that also create understanding and give visual/tangible ways for the kids to interact with the memory work and remember it. The more ways they can interact with the memory work -create associations, see it and hear it - the more likely they are to master it AND enjoy it (you too Mom and Dad)! Video on Weeks 13-24 Math Memory Work I really like this link and we watch it every week a few times to review with. It really helps! Week 24 Presidents Song Review This is also good review and goes with CD. Fun Preposition Song for Review We like this song and used it this year - it's just fun! We also get on CC Connected and watch the timeline motions as I mentioned earlier as well as do the online Tutorials. Variety of ways to hear it/see it, consistency and constant exposure! I hope those ideas help inspire you to come up with new and innovative ways to review the memory work and teach it each week! I'd love to hear any of your ideas in the comments if you have some ways I haven't mentioned above to review your memory work and work towards Memory Master.